Born in the Burgundy region of France, Bernard combines European and American craftsmanship and influence. 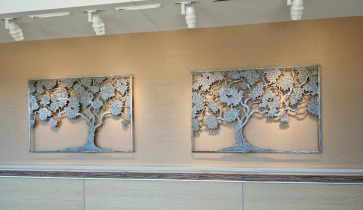 Each metal art piece is individually handcrafted with focus on quality and originality to please the soul as well as the eye. Bernard began his journey with metal crafting at a young age and has always been fascinated how a hard, cold material such as metal can become a timeless treasure with hard work and imagination. While he studied technical ironwork in Macon, France, Bernard is a self-taught artist and designer. In the years to come his natural artistic abilities guided him in his exploration of metalwork where the beautiful natural setting of Burgundy served as inspiration for many of his first designs. Bernard uses his skills of intricate hand-held plasma cutting (a tiny electrical flame followed by a flow of compressed air) as well as delicate forging to develop a quiet confidence for an artful collection. Bernard's breathtaking array of art is uniquely diverse, from intensely forged tables such as the ones inspired by the temples of Angkor Wat, to the light and whimsical work of forged railings and gates, to wall art, lighting, furnishings, home and garden sculptures of primitive or botanical inspiration. His work adorns many homes and gardens as well as the numerous commissioned work he has created for businesses, public buildings and squares throughout both the US and Europe.